Approximate equivalents of actual fabric colors, to be used as a guide. There is no PMS match charge for these colors. ARC & DIAMETER: Measured in inches. IMPRINT AREA: Logos are printed approximately 1.5” from the bottom seam. Maximum imprint width & height vary by product. All orders and artwork must be emailed to order@strombergbrand.com. Your PO number, your company name, and the actual print-ready art must be submitted at the same time. Branding guidelines (if available) are not required but may be helpful. PC FORMAT: Adobe Illustrator vector art. Convert text to outlines, embed linked files, & save as Illustrator (.ai), EPS, SVG, or PDF format. For more details, please see this post on our blog: Getting The Most Out Of Art Files For Screen Printing. MAC FORMAT: Same guidelines as above, plus artwork should be saved in a PC-compatible format. WE DO NOT ACCEPT: BMP, CDR, DAT, DST, GIF, JPG, JPEG, PNG, SIT, TIFF, DOC, DOCX, or hard copy art. Only Illustrator-compatible vector art is accepted. Additional charges may apply if submitted artwork needs to be converted into a usable file. If unsure whether an art file will work, please email us to review the art before submitting your order. For accounts with pre-approved credit lines we offer a 1% discount for payment made in 10 days, net to be paid promptly within 30 days. All prices are subject to change, but orders will not be processed without prior authorization from the customer. Prices for quantities greater than shown herein shall be quoted on request. 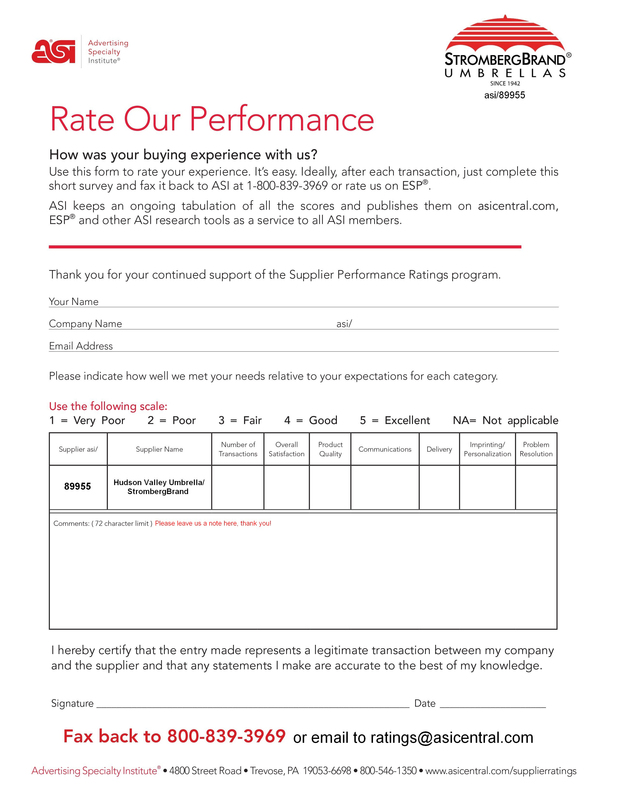 A 24 unit minimum order is required for EQP. Proof of co-op is required and the specific terms of the co-op must be approved by us. Please call for details. All shipments are shipped our best way unless we are notified to follow specific instructions. Must be reported within 15 working days from receipt of merchandise and must have our RA # prominently displayed. We reserve the right to turn away returns/claims not reported within our time frame. We will repair or replace any defective umbrellas returned to us prepaid. This warranty applies to manufacturing defects only. Abuse, misuse, or normal age-related wear is not covered. Warranty returns must have our RA # prominently displayed. All orders considered complete with +/- 5% overrun or underrun. Time is quoted from date of receipt of order, print-ready vector art, approvals, and terms. Production time varies depending on the requirements of each order, and is generally 5-10 working days after all approvals. (We do not begin production on orders without approvals in writing!) For time-sensitive orders, please call ahead to confirm current production times. Mention in-hands date(s) when submitting a PO to ensure orders can be fulfilled on time. Rush orders are not always feasible and may have additional costs. Any customer changes to ship date must be made 5 days prior to scheduled ship date. We may move the ship date of an order if approvals are not recieved on time. 15% of order cost. No cancellation on imprinted merchandise. Certain color fabrics may vary from dye lot to dye lot. Wood finish color on handles may vary from lot to lot. Available at EQP plus shipping. For in-stock items only. Send e-mail sample requests to: sample@strombergbrand.com. Requests received by 2 PM EST will be shipped same day. Samples will be blank or they will have a random imprint. Applies to screen printed orders only (not process or laser). Add 2 weeks to normal delivery time. Rain Umbrellas: $50.00(C) plus cost of item, run charge(s), setup(s), and other charges if applicable (such as PMS matching). Patio Umbrellas $100.00(C) plus cost of item, run charge(s), setup(s), and other charges if applicable (such as PMS matching). Custom overseas orders: $250.00(C) and add 2-3 weeks to normal delivery time. PDF virtual proof of art on item will be provided via email for every order, along with sales order acknowledgement and the art file at actual size (which we will use for printing). There is no charge for these initial virtual proofs, although multiple requests for proofs/revisions may incur a charge (see #27 below, "Art Changes"). Electronic proofs may vary from actual printed product; virtuals are approximations used solely as a visual reference and are not to scale. We will size the actual art appropriately by the size listed for each item. Proofs are sent within 24-48 hours of receiving an order plus its associated camera-ready art. Art saved for 18 months only. Rain Umbrella: $30.00(C) for each color, each design. Patio Umbrellas: Panel $125.00(C), Valance $90.00(C). These prices do not apply to 4-Color Process Printing or Laser Setups. $10.00(C) each. Special packaging is extra. Available on all items which include a matching case (sleeve) except item SB-1710 and SB-2700. Imprint cost is $2.00(C) plus setup; 1-Color 1-Location only, except on special overseas orders. Maximum imprint height is usually 1.5" and dimensions vary by item. Available on all items with wide ties (straps). Imprint cost is $2.00(C) plus setup; 1-Color 1-Location only, except on special overseas orders. Maximum imprint height is usually 0.75" and dimensions vary by item. Printing on the inside of a panel is available at $2.50(C) per color, per design, plus setup. Maximum imprint area is usually 1" less than the outer canopy imprint area and dimensions vary by item. $25.00(C) for straight line copy. $42.00(C) per color, per design. We will mix inks to achieve the closest PMS match. With fabric printing, an exact match cannot be 100% guaranteed. Please note that we cannot perform PMS matches for metallic inks. 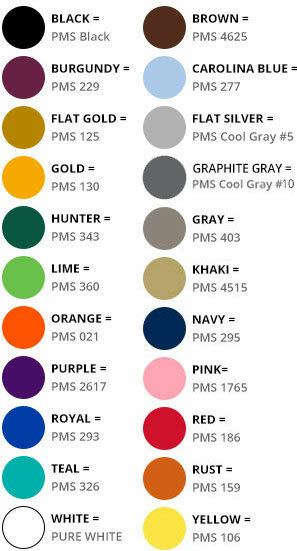 There is no PMS match charge when using our standard ink colors (see above). $42.00(C) Minimum quantity per order is 12 pieces. 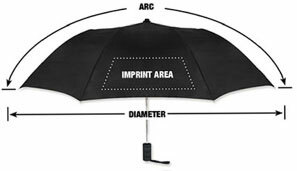 Screen printed umbrellas include a 1-color, 1-location imprint. For additional colors or locations, run charges are as low as $1.60(C). Click Here for details. NOTE: All trademarks shown herein are the sole property of the trademark holder. Merchandise shown with trademarks is purely for illustrative purposes and is not offered for sale by Stromberg Brand without the express written authority of the trademark holder. Prices are subject to change without notice.